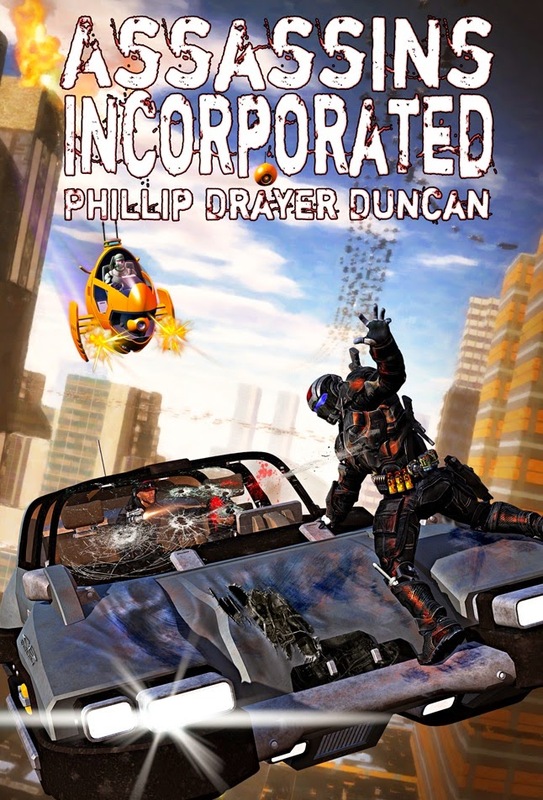 Phillip Drayer Duncan, Author of Assassins Inc.
Today we are interviewing Phillip Drayer Duncan about his sci-fi novel, Assassins Inc. So you’re an assassin. The company you work for just gave you a new target. There’s only one problem… YOU are the target. I actually came across the concept in a dream one night. Just the idea of an assassin being hired to kill himself, being forced on the run, unable to trust anyone. I’ve really wanted to write this story for several years. The main character Brandon was a lot of fun, that sort of lovable loser I think we can all relate too. I imagine everyone has those times when they just feel like to no matter what they do the universe is kind of against them. Off and on since I learned to read, but never seriously until about two years ago. I have to pick just one!? Well… geez, that’s tough. I usually fall back to Legend, by David Gemmell when I have to pick just one. That was the first adult book I read that really just blew me away. Like my writing, I’m kind of all over the place. I don’t worry about genre so much as story. I mean you won’t see me shopping the romance section, but I can’t say I love sci-fi more than fantasy or vice versa. I like to think I’m getting better. It certainly feels that way to me. I look back on earlier things, and all I see are mistakes I wouldn’t be as likely to make today. I don’t stumble nearly as often, or hit my fingers with the hammer, or overbake the turkey as often anymore, but I still have a lot to learn. Editing. Some might not consider it a direct part of the writing process, but it’s still the most important. Great writing CAN’T make a poorly edited book look good, but great editing CAN make a poorly written book look good… Or something like that. Actually, other than the creative writing part, I hated English class. It was always one of my strongest subjects, but it bored me to tears. I enjoyed science and history the most. Personally, I prefer to hold a physical book in my hand, but ebooks taking over is inevitable. If people prefer reading on a device I’m all for it, being bitter about a changing world won’t keep it from changing. Write, edit, publish, sell, repeat…. Hopefully in that order. In all honesty I haven’t really thought about it that far. Within 10 years, I will probably have finished off a lot of character’s storylines. Vanguard of The Desolate World will surely be finished, We Are From Earth will also very likely be finished, and The Moonshine Wizard will probably be getting pretty close… Don’t tell any of the Moonshine Wizard fans I said that… They may hurt me. That is really tough to say. I’ve had some really meaningful ones, but perhaps the biggest eye opening one for me was when I was in a crowded room and idly mentioned in conversation that I would be starting the 2nd Moonshine Wizard novel soon, and all across the room people started yelling at me, “It’s about time!” “We’re tired of waiting!” “C’mon already! I wanna’ know what happens!” There was a brief moment of, ‘What did I get myself into?’ followed, by the realization that these people really love this story, and well, for the writer, that’s pretty special. Very much so. They come to book signings, helped me haul books across the country to cons, dragged me out of bed early so I could make in time for an interview, they’ve edited, they’ve beta read, they too have yelled at me for not continuing my storylines. I’ve been very blessed to have a lot of supportive people around me that are always willing to lend a hand. Writing. Don’t get me wrong, I love writing or I wouldn’t do it, but a lot of the time it’s kind of like trying to make yourself go to the gym. I’ll find any excuse not to sit down and actually do the writing. No writer’s block, but Writer’s laziness is a real problem. As far as beating writer’s block, if I’m not sure what’s going to happen next, I just make something happen. Make the main character fight someone, make some strange happen, or just make something funny happen. For me, it’s easier to connect the dots once the content exists. I love writing with pen and paper, however I hate trying to read my hand writing and retyping, so I do it all on the computer. I can’t justify not doing it on the computer. It makes the editing process a million times easier. If I say anything other than The 2nd Moonshine Wizard novel I might not live long enough to start another project, so let’s go with that. If you haven’t read any of my other work, Assassins Incorporated is a great place to start. Regardless of what genre you read, if you have a sense of humor you’ll probably enjoy it. If you’re a geeky fanboy like myself you will probably love it.